I saw where some guy on the Internet took a million pictures of a souped-up CitiField complete with Met banners, Met historical markers on the sidewalk, giant portraits of Gil Hodges and Casey Stengel ... and other than scratching your head and wondering how on Earth they needed to poll fans last year to inform them this is what the place needed, hats off to the Mets for realizing that was what the place needed. For a different taste of the new season ahead, I'd encourage you to come out for the first Amazin' Tuesday gathering for 2010 at Two Boots Tavern on the Lower East Side. That's this Tuesday, the 23rd, starting at 7 p.m. 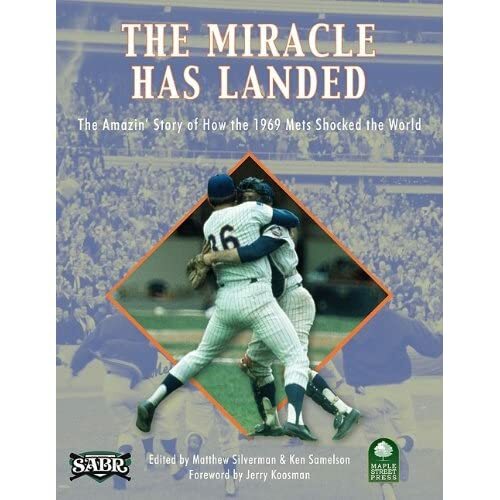 I'll be co-hosting with Greg Prince of Faith & Fear in Flushing, with featured readers Frank "The Mets Poet" Messina and Edward Hoyt, my friend who's a funny guy and terrific writer who contributed compelling bios on Ed Charles and Donn Clendenon to the new book, The Miracle Has Landed. I'll have copies of the MBTN book, and Greg will have his book in paperback, and proceeds from those sales will benefit the Tug McGraw Foundation, the charity founded by the former Met screwball ace funding brain cancer treatment and research via Sharon Chapman, who's running the NYC marathon with Team McGraw. There will be lots of Met discussion, excellent pizza and drinks, and every fan is invited to exchange a Mets baseball card for their first beer. Phil Hartman, owner of Two Boots, is wallpapering the joint with them. Oh, great, as if I wasn't nervous enough. Now I have to be funny. I will be there (as will Joey...he's trying to become the official mascot of Mets bloggers). If I can find an obscure Mets baseball card, perhaps I can get an obscure beer! They have Dykstra and Piazza hanging together...are they trying to say something? Maybe they'll get the stadium right in year two. Maybe the team, too. Hey sounds like fun but will you just be talking about the mets? After last season I would throw up my pizza. Thirdly, the search engines need legit companies to do site optimization. While effective SEO needn't be difficult, it does take work. assigned to Stanford University. I am hoping to show you that I can help you achieve top rankings in the sites like I have for all my other clients. I comprehend what I organized to perceive and they've been greatly clear with me, As a player, that is the entire thing you can ask. I joined to do anything they've ask for Essay Editing UK. I take the ball when they show me to take it and me give it back when they take it from me. Woah! I'm really www.uk.college-paper.org/ enjoying the template/theme of this site. It's simple, yet effective. A lot of times it's hard to get that "perfect balance" between user friendliness and visual appeal. I must say that you've done a very good job with this. Additionally, the blog loads super quick for me on Safari. Outstanding Blog! I also enjoy reading the comments, but notice that a lot of people should stay on topic to try and add value to the original blog post. I would also encourage ukessay review everyone to bookmark this page to your favorite service to help spread the word. I'll use this information for my essay topics.